A turbidostat is a machine capable of maintaining the optical density, or turbidity, of a cell culture in liquid medium. Dr. Brian Ingalls, one of the principal investigators supervising the Waterloo iGEM team, and Dr. Matt Scott commissioned Mark Soric, an associate of the lab, to make a turbidostat from scratch for use in the Ingalls lab. Turbidostats are not widely available on the market, and there are currently few companies capable of tailor-making them for specific projects. 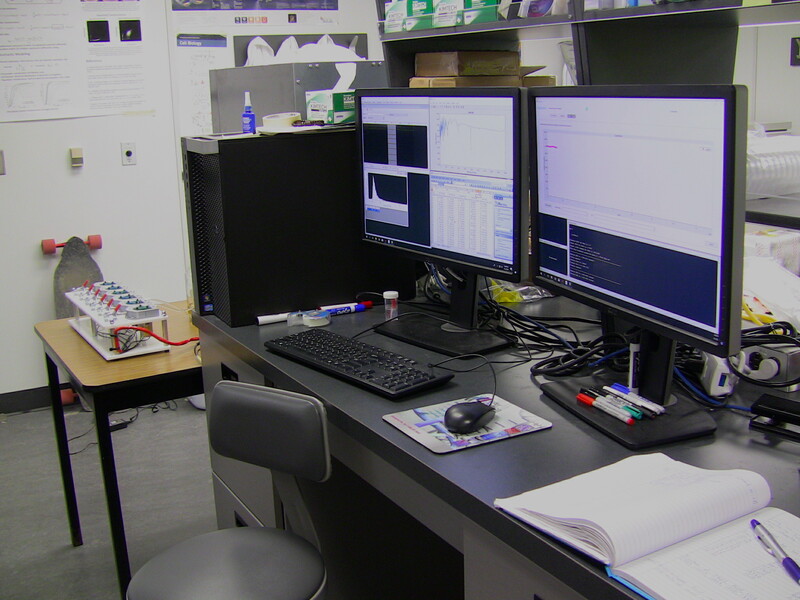 The first generation of Mark Soric's design is in the Ingalls lab, and the second generation model is currently under construction. The machine functions as described in the following paragraphs. 40 mL sample vials are placed in the 3D printed holder, and filled with approximately 25 mL of culture. The motors connected to the PCB alternate between spinning and being still, which controls a magnetic stir bar to aerate the sample. The cells do not settle down to the bottom of the vial when the motors are not stirring. However, the liquid in the vial must settle for at least 1 minute before the machine can take an accurate turbidity measurement, to prevent interference from bubbles and swirling cells. The turbidostat measures OD by shining a red LED through the sample and measuring the amount of light that passes through the sample via a photodiode opposite the LED. Before operation, a spectrophotometer is used to generate an OD calibration curve of OD to compare with the photodiode readings. In addition to a liquid sample and a stir bar, the sample vial has a lid attached to it with three ports. The first port connects to an air filter, allowing oxygen, but not dust, to travel into the containerh. The second port is a feed line, through which new liquid media can be delivered. The third is a waste line, where old media is removed via vacuum. See below for a video of a sample vial being stirred. 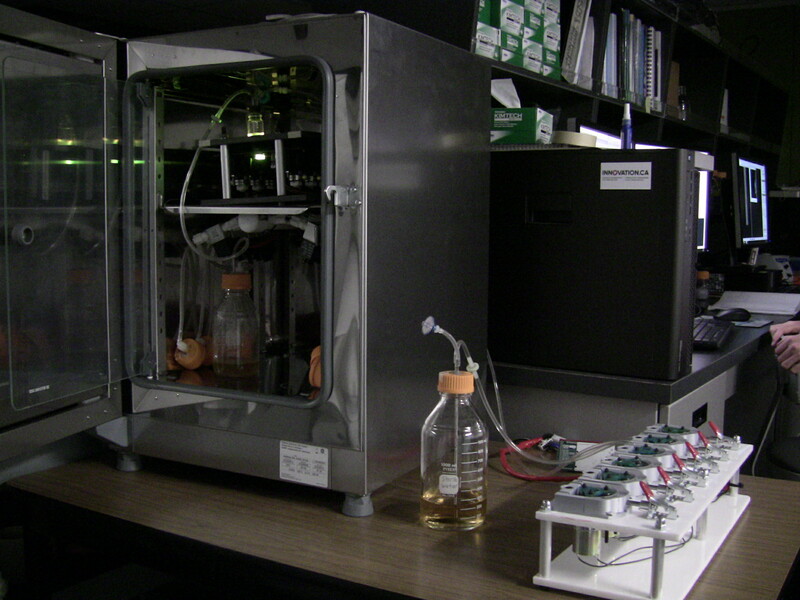 The peristaltic pump associated with the sample vial that passed the threshold is activated. The pump moves about 5 mL of liquid media from a source vial outside the incubator through the feed line and into the sample vial. The motor attached to the PCB that is associated with the vial of interest turns on. This spins the stir bar and mixes the new media with the media already in the vial. The motor turns off and the vacuum activates. This removes a volume of media equivalent to that which was inputted in step 1 and completes the dilution process. Upon leaving the sample vial, the extra media passes first through an intermediate vial, then a final waste vial. The intermediate vial is present in the event that the user wants to sample some of the most recent flushed contents, and the container is easily replaceable to allow multiple subsequent samples as necessary. The final waste vial collects unwanted cells. Another interesting and important aspect of the turbidostat is that it is able to subject vials to time varying amounts of red and green light. There are red and green LEDs built into the PCB, and their intensities can be controlled via the associated MatLab program. This allows manipulation of the optogenetic system relevant to this project, while maintaining cells at a constant OD. The turbidostat also enables our team to perform long experiments, essential for this project. See the image below for the GUI of the turbidostat’s MatLab program (designed primarily by Mark Soric) and its assorted ancilliary data.